This fall, the College of Science welcomed 728 new first-year students, an increase of 4.7 percent from last fall’s enrollment. Twenty-six percent, or 193 first-year students, indicated they are first in their family to attend college, approximately a 12 percent increase from last year; about 16 percent are underrepresented minorities. The College is thrilled to welcome the highest ever number of high achieving students in its incoming class: 50 percent—up from 29 percent last year! These students enter OSU with a high school GPA of 3.75 and above. The College has the highest number of high-achieving students at Oregon State. The College of Science welcomed 180 transfer students, the majority of whom transfer into the College as upperclassmen—about 50 percent are juniors and 18 percent are seniors. Nearly 20 percent of transfer students had a GPA of 3.75 or above. Thirty-five percent of incoming transfer students indicated they are first in their family to attend college and about 12 percent are underrepresented minorities. The College’s ability to attract diverse students points to the strength of campus-wide science, technology, engineering and mathematics (STEM) programs such as LSAMP (Louis Stokes Alliance for Minority Participation), OSU STEM Leaders and SACNAS (Society for the Advancement of Chicanos/Hispanics and Native Americans in Science), which help to connect and fuel students interest in science through workshops, peer mentoring and research experiences helping them succeed both on campus and in their future professions. 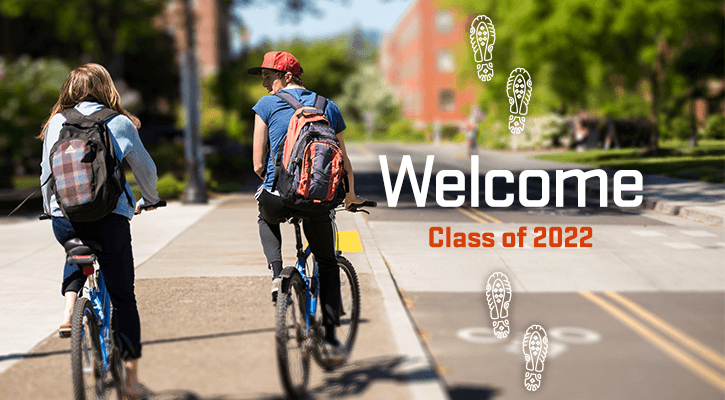 “I am delighted to welcome the class of 2022 to the College of Science. I hope they take advantage of the many opportunities to expand their personal, professional and intellectual horizons in science. Our faculty and advisors are committed to student success,” said Roy Haggerty, dean of the College of Science. The majority of the 728 students in the class of 2022—68 percent—identified as female, which constitutes the highest number of first-year women students in science. While nationwide, women have been enrolling in and graduating from college in greater numbers than men for the last few decades, the data on women pursuing undergraduate degrees in science and mathematics tends to fluctuate across disciplines and fields. Data from the National Student Clearinghouse Research Center show that in 2016, 42 percent women and 58 percent men earned bachelor’s degrees in mathematics. In biological and agricultural sciences, the numbers were 60 percent women and 40 percent men. Among underrepresented minority students, Asian students numbered the highest this year at 129, followed by Hispanic students at 90. Parsing the numbers further shows a strong correlation between a first-year student’s ethnicity and her or his parents’ educational background: nearly 19 percent of the 193 students who are the first in their family to attend college are also underrepresented minority students. Of the 375 high-achieving students, only 19 percent or 73 are first-generation students, an increase of 9 percent from last year; and just 7 percent or 26 are minority students (see infographic below). About five percent or 20 out of 375 high achieving students are both minority and first-generation students. Like in previous years, biology and the biohealth sciences majors attracted the greatest number of students—34 percent or 237 students, down nearly 6 percent from fall 2017; and 28 percent or 194 students, up 2 percent from last fall, respectively. Of 744 students, 2.6. percent are biochemistry and biophysics majors, 9 percent are biochemistry and molecular biology students (increased), 5.6 percent are zoology majors, 8.6. percent are chemistry majors (increased), 4.7 percent will major in mathematics, 4 percent are physics majors (increased), and 3.6 percent are microbiology students (increased). With a strong laboratory and research focus, our recently launched Biochemistry and Molecular Biology major has proven popular and almost doubled its second cohort with 64 students. The Department of Mathematics welcomed 33 first-year students, continuing to break its record for the highest number of math majors set in 2013. The number of physics students too has risen steadily at 29 first-year students, the highest since 2013. According to the 2016 Annual Survey of Mathematical Sciences published by AMS, total undergraduate enrollments for mathematics, applied math, statistics and biostatistics across public and private universities (medium, small and large) has increased slightly from 2,481,000 to 2,518,000 since 2012. Mathematics doctoral departments such as OSU awarded 13 percent more bachelor’s degrees in 2016 as compared to 2015, an increase of five percent. Of those, 40 percent were earned by women, a nine percent increase. In 2016, master’s degrees awarded increased by 12 percent from 2015. Once again 40 percent of master’s degrees were earned by women, a 6% increase during the same period.